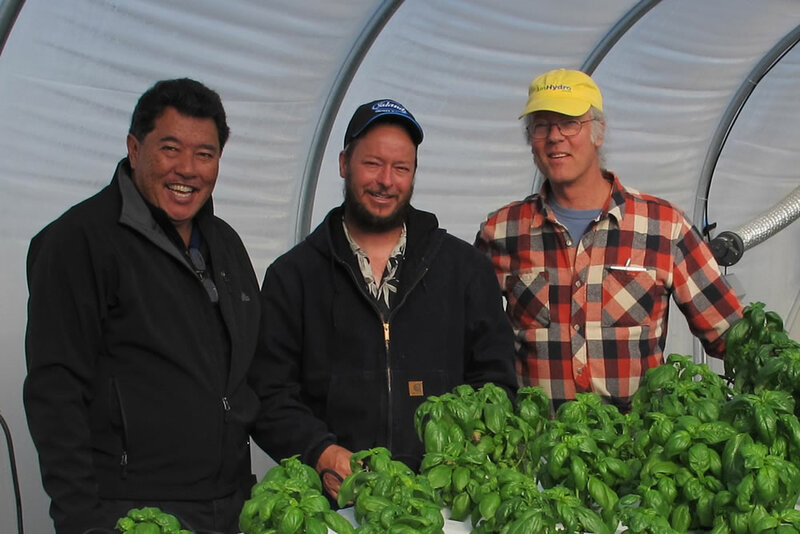 With the clock ticking and much to lose, Agra Tech, Inc., (ATI) a manufacturer of commercial greenhouses, in conjunction with Ag-Con Construction, saved the day for Monrovia Nurseries, headquartered in Azusa, California. By acting quickly and making a series of sage decisions along the way, Agra Tech and Ag-Con Construction pooled their cumulative experience and skills to prevent a possibly tragic situation for Monrovia’s citrus crop in Visalia, California. First, let’s set up the story. Ted Styner is a technical services coach and a facilities manager for Monrovia Nurseries, a company that has been growing plants since 1926. He oversees 1,580 acres with 650 in production, all of which are used for growing plants in containers. 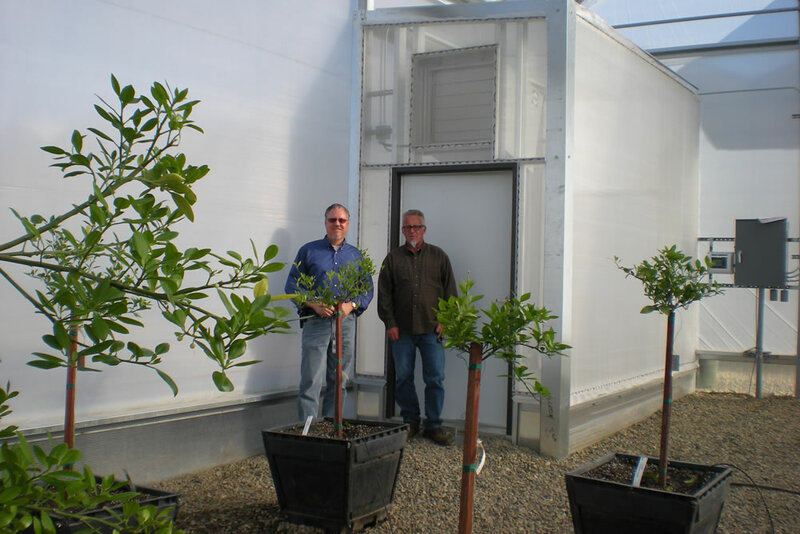 Styner played an integral manager’s role late last year in the design and speedy construction of a 60 ft. by 84 ft. greenhouse with a 6 ft. by 12 ft. entry vestibule that could prevent the potential infestation of Monrovia’s citrus trees by the hyper-destructive psyllid insect. If you’re already familiar with citrus psyllids, then you know they are small plant-feeding insects that tend to be very host specific and can quickly decimate lemon, orange, grapefruit and other citrus trees. The Asian citrus psyllid (ACP) is an aphid-like insect that transmits the disease Huanglongbing (HLB) when it feeds on the plants’ leaves and stems. HLB is the most devastating disease that any citrus tree can encounter. Symptoms include yellow shoots, leaf mottle, small upright leaves and inedible fruit. Infected trees will decline in health gradually and eventually perish. There is no cure for HLB at this time, and infected trees must be eradicated in order to prevent further spreading of the disease. States like Mississippi and Alabama have detected the ACP, and in California, Florida, Georgia, Louisiana, South Carolina and Texas they’ve discovered both psyllids and HLB. They’ve even found some ACP in Hawaii and the problem has become chronic south of the border in Mexico. 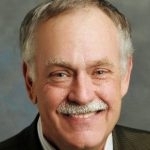 Florida has reported that ACP and HLB have cost their state more $7 billion and more than 6,000 jobs since 2008. 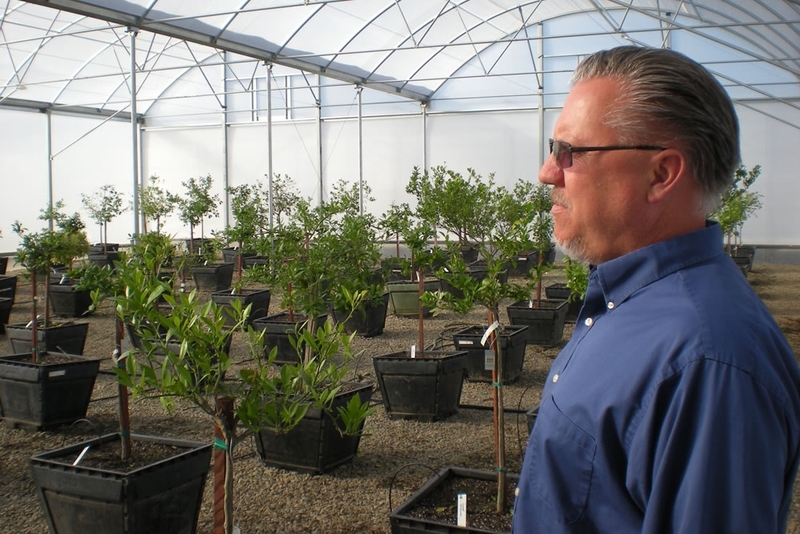 The deadline was looming, because by law all of the citrus plants grown in California had to be certified psyllid-free by the beginning of 2013 Styner said. “We knew time was not on our side, so we talked to three companies and chose Agra Tech. 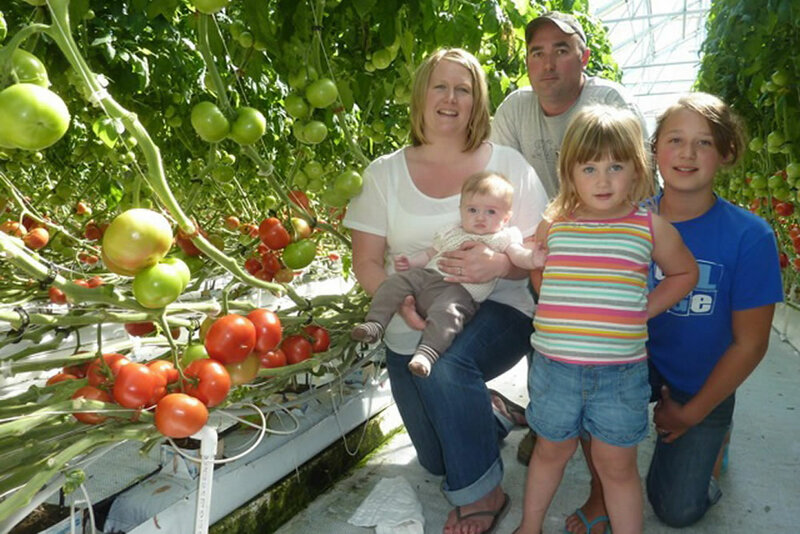 We were anxious to get rolling, because now it was October and we obviously had to get the greenhouse completely built, inspected and ready for use by December 31st, 2012". 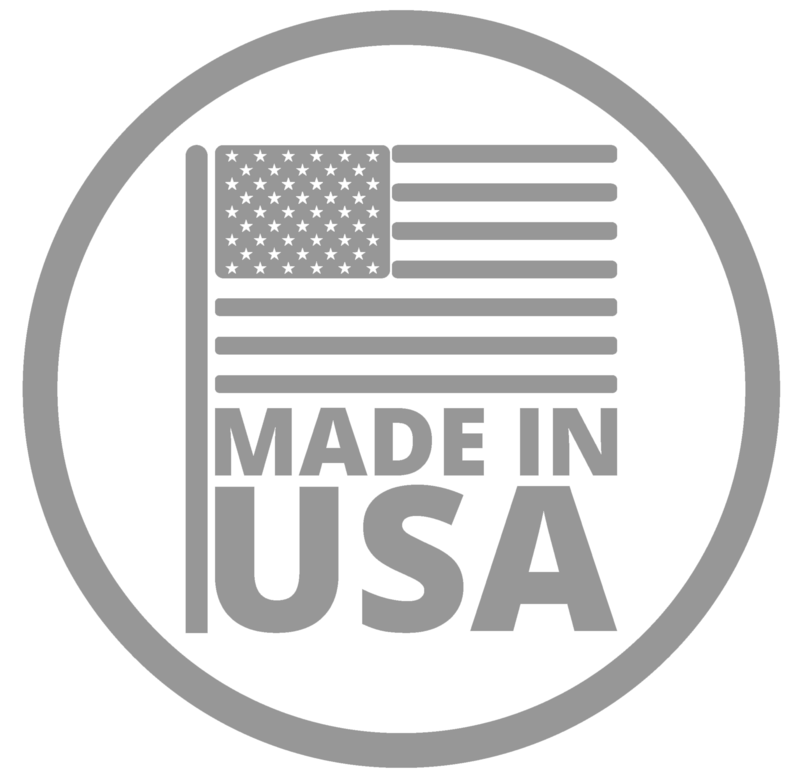 “Sales Engineer Jim Bergantz at Agra Tech presented us with all of the options, so that we could make an educated decision,” Styner said. “We used a greenhouse that Agra Tech already had in its inventory and ended up covering it with a very effective mesh screen, to keep the psyllids out. We were worried about the date, because we had to get a lot of things done, but there wasn’t a lot of time left. ATI created a one-of-a-kind custom greenhouse for us and it was completed two days before schedule. We were obviously relived and very happy". Ray Pound, the owner of Ag-Con Construction in San Jose, California handled all of the assembly and building of the greenhouse and its entry vestibule, he said. “We showed up with a four-man crew and completed the job in around 3.5 weeks without any overtime. It was a labor-intensive job, because we had to be sure it was 100% sealed. There were a lot of visual inspections and caulking and applying sealant to guarantee its ability to keep any insect out".